The research of doctoral marshal Eve Ewing examines school closures and the impact they have on communities. 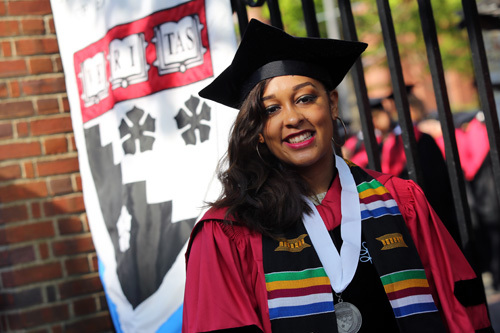 The decision to come to Harvard Graduate School of Education — thus leaving behind a classroom of eager and excited eighth-graders in the Bronzeville community of Chicago — wasn’t an easy one for Eve Ewing, Ed.M.’13, Ed.D.’16. Looking back, Ewing says, it was naive to think that she could solve all the larger problems that exist in education, but that very thinking is part of what drew her to HGSE. As a teacher, she witnessed inequities in the system despite students, their families, and colleagues doing the best they could. The heart of the research explores how and why school administrations and communities have no say in the decision to close a school. In her discovery, Ewing admits it isn’t so much that schools should never be closed as much as it is that the reasons and “calculus” to make those decisions is off. In the case of the Bronzeville neighborhood — an area that was instrumental in the history of African Americans migrating from the south to the north — schools were named after famous African American luminaries such as Daniel Hale Williams, a doctor who opened the first nonsegregated hospital in America, and Anthony Overton, the first African American leader of a business conglomerate. Closing these schools and displacing students, Ewing argues, sends a broader message from the school district that they don’t care about that legacy. She will return home this summer where she’ll spend the next two years working as a postdoctoral fellow at the University of Chicago turning her dissertation into a book. Then, in 2018, she’ll begin working as an assistant professor at the School of Social Service Administration at the University of Chicago. “I love teaching and engaging with students, but to have those two years to push my work to next stage will be a huge gift for me,” she says.